Observe packers as they work - does the job flow? Because the packer is your last employee to touch a shipment before it reaches your customer, it's an especially overlooked and critical position in many companies. The packer's work is often the face of your company, and packing needs to be given special attention in a customer-focused order fulfillment operation. 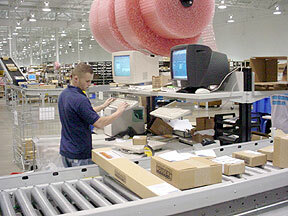 He is the last line of defense for preventing incorrect or damaged shipments. Are you giving him the best support system you can, in terms of the packing area, equipment and processes? Calculate the number of steps your packers are taking. Do they often have to bend, reach, or strain? Do administrative tasks like keyboarding, waiting on printouts, or stuffing packing slips take up a lot of their day? Note in particular how long it is taking them to replenish supplies. If product is delivered in a way that doesn't easily flow, note that, and try to calculate how many minutes, or hours a day all of this activity takes up. Use a pedometer: One good idea is to start working with pedometers. Use them to track movement over time. The lower the number of steps a packer takes during the day, the better. Over time, as you make improvements that eliminate walking, track your packer's steps. The trend should be fewer. The idea is that the more time they spend doing these things, the less time they are spending on the value-add of the job - packing orders correctly. Does the work "flow" at the packing station? This simply means trying to find out if the placement of various elements makes sense for the way the job is done. Is the material flow into and out of the packing station efficient? Is the packing area cluttered? Do unnecessary objects get in the way of efficiently performing the packing operation? Are cartons, rolls of paper, and other packing materials hard to reach or located outside the packing area? Could the workstation be made more effective if you added a shelf for a monitor? Is there enough working space to keep the packers focused on task rather than dealing with clutter? See packing bench configuration for more comprehensive workstation design information. Can in-line systems such as pillow or paper dispensers be utilized? How about an in-line taping machine? In-line weighing systems are another possibility. If flow of work is the chief concern, then automation can push the needle in the right direction. Is your packing area a bottleneck? What happens to the carton after it is packed? What kind of staging or moving system will be used? How will the staging or moving system fit into the company material handling flow? How can lifting and carrying be avoided? Answer these questions, and you're on your way to optimizing your packing and manifesting operation.